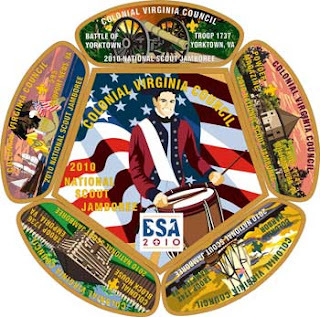 Colonial Virginia Council will be issuing a colorful 6-piece set of patches for the upcoming 2010 National Scout Jamboree scheduled for July 26 - August 4 at Fort AP Hill near Bowling Green, Virginia. The set includes five different shoulder patches, including one for the Council and one for each troop attending the Jamboree from Colonial Virginia Council. The shoulder patches represent Scouts from the following cities, with a themed design appropriate to each. The five patches fit around a center pentagon-shaped patch that features a colonial drummer with an American flag background and the official BSA centennial logo. 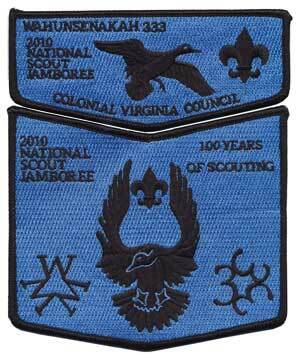 Thanks to Larry Johnson for the picture of the 2010 Colonial Virginia Jamboree patches. Wahunsenakah Lodge 333 has issued a two-piece set for the upcoming 2010 National Scout Jamboree to be held July 26 - August 4 at Fort AP Hill near Bowling Green, Virginia. The picture of the patch is above and is now also included on the Lodge 333 Emblems page, where you can view pictures of the flaps the Lodge issued for previous National Jamborees in 1997, 2001, and 2005. Thanks to Larry Johnson for providing the image of this patch.